It is now well publicised that the world’s fish stocks are in trouble. Decades of mismanagement and continued overfishing have reduced many species’ populations to the brink of extinction. There is hope, however. Consumers, government and the seafood industry are becoming aware of their impact and fishers and farmers are changing their practices in accordance. As consumers, our role is to be mindful of our seafood consumption, choose more sustainable species from well-managed fisheries and send a clear message up the supply chain (to chefs, retailers, wholesalers, farmers and fishers) that responsible practices are a viable and necessary part of their industry. What Makes a Species ‘More’ or ‘Less’ Sustainable? 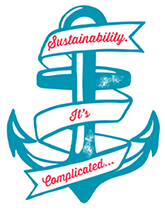 ‘Sustainability’ is a very hard thing to define, especially when it relates to seafood. There are many different factors that need to be assessed, such as a species’ total population, breeding habits (how long it takes for a population to regenerate), migration routes, and fishing methods employed, as well as the effects of fishing pressure on the broader ecosystem. And that’s just wild fisheries… Aquaculture (fish farming) is another kettle of fish entirely! It’s no wonder that different groups and individuals sometimes come to different conclusions about what is sustainable and what isn’t. Two common species well loved by most Australian’s are Barramundi and Snapper. Both are tricky, so we thought we better have a closer look at them. Snapper is caught by a range of fishing methods throughout Australia, from the south of Qld right around to central WA. It is also imported from NZ. Most have been overfished in the past, and they are in various states of recovery. The Victorian stock is currently the healthiest and was accredited as sustainable by the Sustainable Australian Seafood Assessment Program (SASAP) in 2011. Read more about SASAP and the seafood products they’ve assess as sustainable here. The Barramundi available to us in Australia comes from a range of sources. 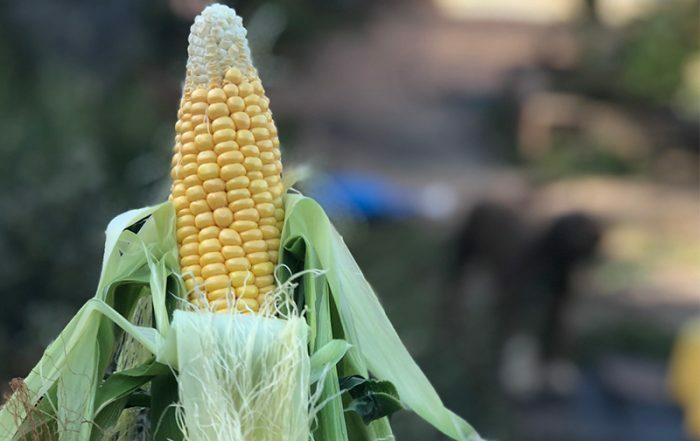 It may be imported farmed product, local wild, or local farmed. So how are we to decide which Barramundi we should be eating? The AMCS recommends that consumers ‘Say No’ to imported farmed Barra as well as local product that is the result of sea cage aquaculture, while advising that you ‘Think Twice’ about local fish from the wild or land-based farms. However, Cone Bay Barramundi, a product of sea cage aquaculture, has been identified as sustainable by the Sustainable Australian Seafood Assessment Program (SASAP) due to its best practice management and low environmental impact. The different guides out there serve different purposes and have varying core values at the heart of their recommendations. It is the task of you as a consumer to find a group whose values align with your own. Choosing sustainable seafood isn’t black and white, but it doesn’t have to be a stressful experience either. You may want to consider the origin of what you purchase, and how it was fished or farmed. 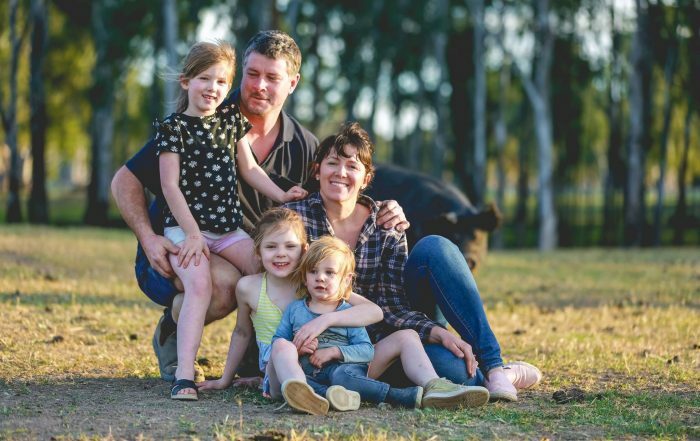 If in doubt, start by supporting Australian producers and go from there. Never be afraid to ask questions, it’s the only way seafood suppliers, retailers and the hospitality industry will know what their customers want. At the pointy end of the matter, though, is the fact that sustainability is less about fish species than it is about our own behaviour. The truth is there is no such thing as ‘sustainable seafood’. Our role as consumers doesn’t begin and end with which fish species to choose at the fishmonger. At the end of the day, the buck starts and stops with not only what, but how and how much. What we consume, farm and fish – Which species should we avoid, which should we opt for, are there species of fish more suited to farming? Where is the seafood coming from – locally, overseas, well managed or poorly managed fisheries and farms? How we consume, farm and fish – Do we use the whole fish or do we waste bits of it? Do we cook it with respect or does it get lost in other ingredients? Which fishing and farming techniques are less destructive or even beneficial to the environment and ecosystems? How much we consume, farm and fish – Are we being mindful of how often we eat seafood and of our serving sizes? Are we overfishing populations? Are we intensively farming fish at the expense of the environment, ecosystems, animal welfare and our health? Or fast track to Holy Mackerel! What You Can Do to see our 5 Steps to Sustainable Seafood and more. A whopping 72% of the seafood eaten in Australia is imported from countries including Thailand, China, New Zealand and Vietnam. That equates to 200,000 tonnes of seafood imported annually. This makes seafood our largest food product import by far. What type of seafood is imported? Canned fish such as Tuna and Salmon, frozen fish fillets, Prawns and Squid are the major imported items. Retail stores, restaurants and catering operations mostly – not for use as bait for instance. Imports typically make up more than half of the seafood range in the major supermarket chains. Independent fishmongers focus more on Australian produce and sell fewer imports than the supermarkets. What’s the problem with cheap imports? Prawns were once treated like gold and only whipped out on very special occasions – birthdays, wedding anniversaries, Christmas lunches… Well that was then. Nowadays Prawns are everywhere. They’re cheap enough to be thrown on or in anything: curries, pasta, sushi, pizza (a garlic prawn pizza can cost a mere $15). What happened and what is the true cost? A total of 75% of the world’s farmed Prawns are produced in Asia alone, mainly for export. In Australia 50% of the Prawns we consume are imported and sold at a much cheaper price than local prawns. The problem is that whilst we’re paying just a few dollars a kilo, the environment and the Prawn-farming communities pay a significantly higher price. Environmental destruction, food insecurity, human rights abuses and illegal land-seizures are just a few examples of the problems associated with Prawn farming in Asia and Latin America. If you’re eating cheap Prawns today, it almost certainly comes from a turbid, pesticide and antibiotic filled, virus-laden pond in the tropical climes of one of the world’s poorest nations. 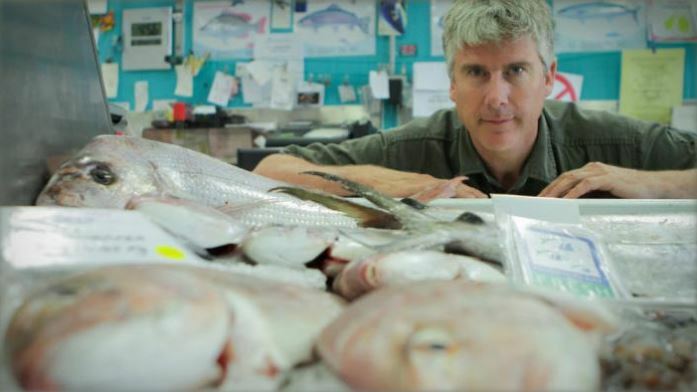 Taras Grescoe Author of Bottomfeeder: How to Eat Ethically in a World of Vanishing Seafood. In this SBS television series, author Matthew Evans explores prawn farming practices in Thailand, where much of our imported prawns are sourced from, and shows the devastating impact our insatiable appetite for prawns is having. Sushi and canned tuna fans are plentiful, but our insatiable appetite for tuna has driven many of the tuna species to the brink of extinction. 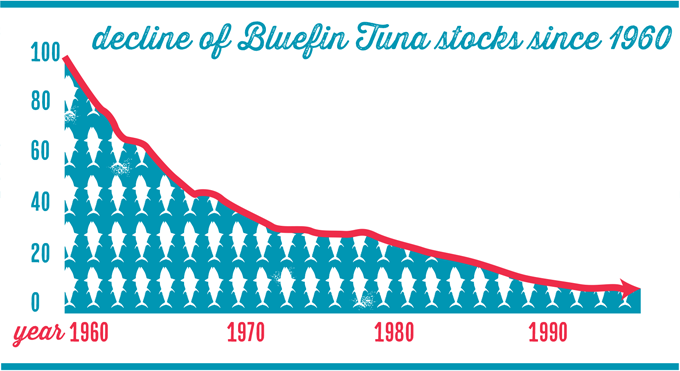 In fact, Atlantic Bluefin tuna stocks have been driven to just 3% of their 1960s numbers – a decline of 97%. Besides being delicious and wanting to preserve tuna stocks for generations to come, Tuna, like Sharks, are apex predators – top of the food chain with not many natural predators. Taking too many apex predators out of our oceans disrupts the entire ecosystem. Can’t the big tuna make more little tuna? Tuna are slow-growing and long-lived fish, meaning they take a long time to get to an age of sexual maturity in order to reproduce. This means populations in decline take a long time to recover. Also, current practices of taking juvenile Bluefin Tuna out of the oceans and placing them into sea-cage farms to be fattened means they are killed before they are able to produce young. In this episode of the SBS television series What’s the Catch, author Matthew Evans investigates the issues surrounding eating and farming tuna, in particular Southern Bluefin Tuna. With it taking up 10kg of feed to produce 1kg of tuna, is tuna farming something we should be practising? Are the health concerns around eating tuna valid? Yes. The health concerns are around mercury levels, because mercury can affect brain and nervous system function and development, particularly in developing foetuses. Mercury is found in the ocean and is consumed by all fish. Mercury gets more and more concentrated the higher up the food chain you go, so large predatory fish like tuna and shark right at the top of the food chain can contain harmful levels of mercury. If going without canned tuna is not something you’re able or willing to do right now, be sure to check out the Greenpeace Canned Tuna Guide to learn which brands are ranked higher than others on the sustainability scale. 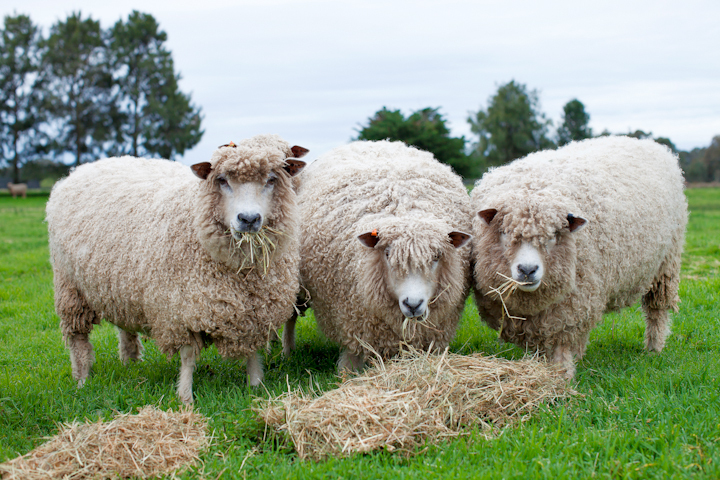 If you consider yourself to be an ethical meat eater then chances are you know exactly where and how to select meat so that the origin and farming methods are known. When it comes to being a mindful seafood eater, it is not so easy. In Australia, country of origin labelling is now legally required for seafood products. This is a step in the right direction for seafood traceability, however it applies only to retailers – restaurants are not required to inform customers where their seafood comes from. The best you can do is ask questions and express your desire for more information and clearer labelling on menus. Also look out for the blue MSC eco-label when shopping or dining out. The Marine Stewardship Council (MSC) is an independent, non-profit organisation that provides certifications and eco-labelling for sustainable wild-captured seafood. In this episode of the SBS series What’s the Catch, author Matthew Evans explores the impact that poor labelling laws is having on fish species, in particular one of Australia’s favourite fish, flake. You can have your say and push for better labelling laws in Australia by sending an email to the government via the Label My Fish website. Every email sent is a step closer to better labelling standards across the country. Around ¼ of the world’s catch is bycatch – turtles, seals, sharks, dolphins, seabirds and unintended fish species that get tangled up in the fishing gear. Usually they are thrown back into the ocean and are often dying or are already dead. The fishing methods used to catch Tuna, Blue Grenadier (or Hoki) and wild-caught Prawns yield some of the highest levels of bycatch. Overfishing occurs when more fish are caught than the population can replace through natural reproduction. Overfishing has placed many fish species near extinction. Bluefin Tuna, Shark, Swordfish and Orange Roughy (Deep Sea Perch) are some of the most overfished species that should be avoided. Fisheries use a range of different techniques to catch seafood. Some of these have a much greater impact on marine environments than others, so it makes sense to support those fisheries that employ least-damaging fishing techniques. Some lower-impact fishing methods include pole and line fishing, dive collection and pots and traps. Fishing methods that are known to have a negative impact include bottom trawling, gillnet and dredging, which is often used to collect scallops and clams. For a complete run-down on fishing techniques, visit GoodFishBadFish. Aquaculture or fish farming is a huge industry, and the world’s fastest growing food sector. It now produces over 50% of the world’s seafood. Fish farming is often touted as the solution to overfishing, but is it? Antibiotics may be used to stave off disease. There are also issues of fish welfare, pollution, land degradation and impacts to native fish populations and eco-systems. Carnivorous fish raised in farms are fed wild caught fish in the form of fishmeal (pellets comprising small schooling fish species). It takes up to 2kg of fishmeal to produce 1kg of farmed Salmon, which places even more pressure on wild fisheries. The fish farming industry is working hard to reduce this ratio and while fish farming may not be the answer, it must form part of the solution. Open sea-cage aquaculture is growing and is considered to be one of the most concerning types of fish farming due to farms being set up in natural waterways. Significant issues include increased disease and parasite transmission and fish welfare concerns due to high fish densities, the risk of escape and interbreeding with wild populations, and reduced water quality resulting from the accumulation of faecal waste. Note Atlantic salmon from Tasmania is raised in this way. Closed aquaculture systems are primarily used for freshwater species with Silver Perch, Barramundi, Yabbies and Marron amongst the most common marketable species in Australia. Blacklip and Greenlip abalone are the main marine species produced in closed systems, and are experiencing rapid growth due to demand from Asian markets. Closed system aquaculture is considered one of the more environmentally conscious methods of rearing aquatic species because of the tight control over waste water and the prevention of fish escape. For more detailed information on fishing methods and fish farming visit goodfishbadfish.com.au. It would be unfair to blame all the problems of our oceans and waterways on lack of government regulation and the fishing industry. Human-caused pollution is affecting marine life and it is something we can all make personal efforts to reduce. Each Australian is responsible for 69 kilograms of plastic waste every year, which could end up in our oceans affecting marine life and ocean health. Chemical runoff from conventional farms is also significantly contributing to growing marine dead zones around the world and toxic algae blooms. The choice to purchase organic and chemical-free food is a decision you make for your own health and that of our environment and oceans. Holy Mackerel! What Can I Do? 1. Diversify your choice & switch your fish! Populations of popular seafood species such as Shark (Flake*), Tuna and Swordfish have been reduced to only 10% of what they were in the 1950s. Try something different, eat lower on the food chain (these fish regenerate more quickly) and give the popular species a break to preserve the balance of the ocean and ensure that future generations can enjoy them too. Check out our Switch the Fish Guide below, or download the AMCS smartphone app for a list of ‘better choice’ seafood options. Or go veg instead! In Australia, country of origin labelling is now legally required for seafood products, but there’s still a lot missing from labels, such as fishing and farming method and standardised species names. Be a savvy shopper and ask questions. A whopping 72% of the seafood Aussies eat is imported. Cheap imports are often fished and farmed without the same regulation, which adds to the environmental pressure placed on our oceans. Support local communities and sustainable fisheries where possible and if you are buying fish from overseas look for accreditation logos (i.e. MSC) and sustainable fish species. Although our fondness for seafood may be growing, the number of fish in our oceans is not. Out of 93 fish stocks that are assessed in Australia, eleven species are classified as overfished, a further three are subject to overfishing and there is uncertainty around another 24 species. At the same time 80 per cent of the world’s fish stocks are fully exploited or overexploited. So, as consumers, what should we do to ensure we can have our fishcake and eat it too? The answer is pretty clear – we must adopt a new way of eating seafood. Make seafood a treat by choosing it less often and when you do, enjoy sensible portions of sustainable species that haven’t been overfished or harvested using destructive methods. Australians dispose of 1.9 million tonnes of plastic packaging every year – that’s enough to fill the MCG 9 times over! A gigantic plastic soup twice the size of France, containing over 100 million tonnes of waste has now formed in the Pacific Ocean and more than one million birds and marine animals die each year from consuming or becoming caught in plastic and other debris. Buy fresh to avoid unnecessary packaging. Fresh seafood will have been caught closer to where it is sold and thus have travelled a shorter distance to reach your plate. 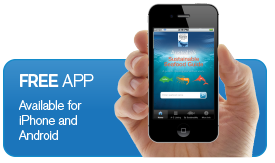 Download the Australian Marine Conservation Society’s Sustainable Seafood Guide for iphone and Android, or alternatively check it out online. 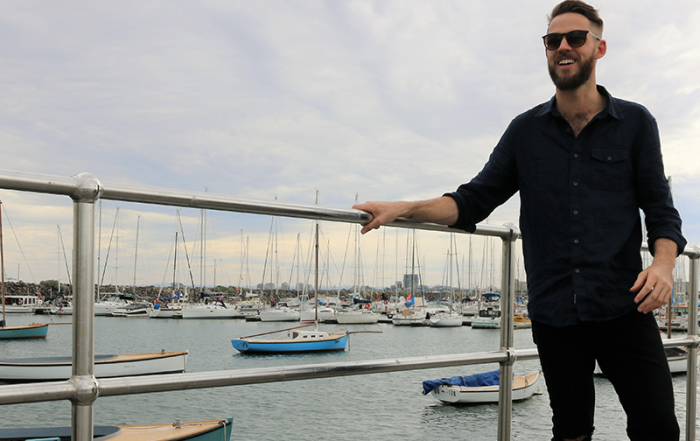 It’s the first online sustainability guide for seafood consumers in Australia and was developed in response to growing public concern about overfishing and its impact on our oceans and wildlife. 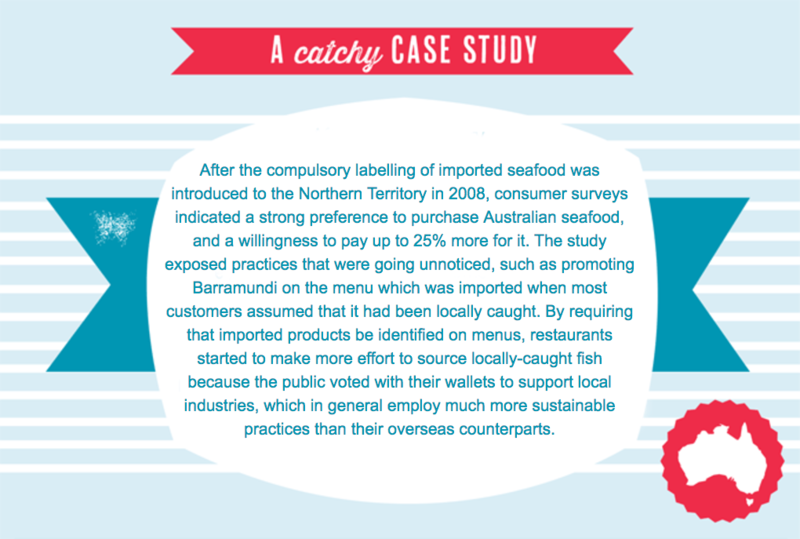 It is designed to help you make informed seafood choices and play a part in swelling the tide for sustainable seafood in Australia. Sushi and canned tuna fans are plentiful, but our insatiable appetite for tuna has driven many of the tuna species to the brink of extinction. For example, Atlantic Bluefin tuna stocks have been driven to just 3% of their 1960s numbers – a decline of 97%. Did a turtle die for your canned tuna? 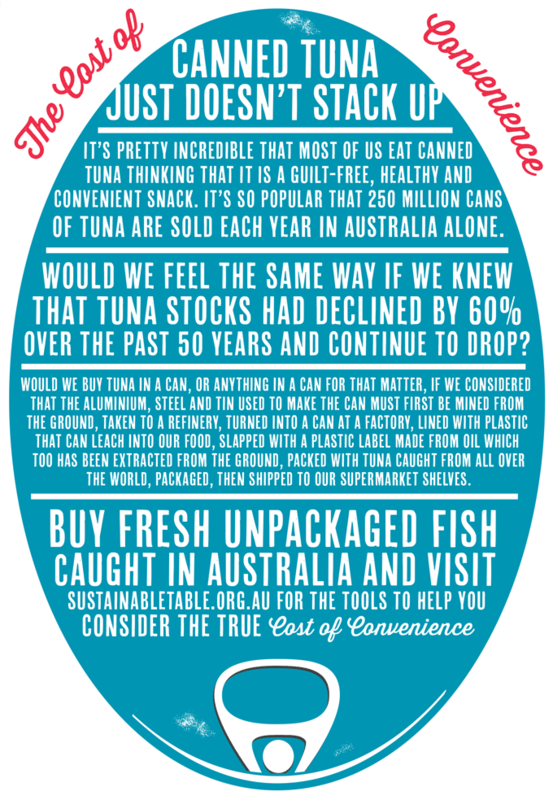 How does your favourite brand of canned tuna stack up on sustainability? This guide helps you choose canned tuna that is more sustainable. As discussed earlier, avoiding packaging altogether is ideal, as cans contained mined materials and must go through a long recycling process, however, if you do choose to indulge it’s best to know how different brands stack up. According to Greenpeace it’s best to look for ‘100% FAD-free* and pole and line caught’ Skipjack Tuna from the West and Central Pacific, which is the most sustainable tuna stock. Whereas Yellowfin, Albacore, Bigeye and Southern Bluefin Tuna are all endangered, overfished or near-threatened. *A Fish aggregating device (FAD) attracts large numbers of fish to one area, which is hugely destructive when combined with a purse seine net to harvest these populations of fish. Pole and line is one of the most sustainable methods of catching tuna because each fish is individually caught and thus there is no bycatch or damage to the surrounding marine habitat. Greenpeace ranks Fish 4 Eva, Safcol and Coles Tuna as the top choices, with Greenseas and Sole Mare scoring the worst on sustainability. 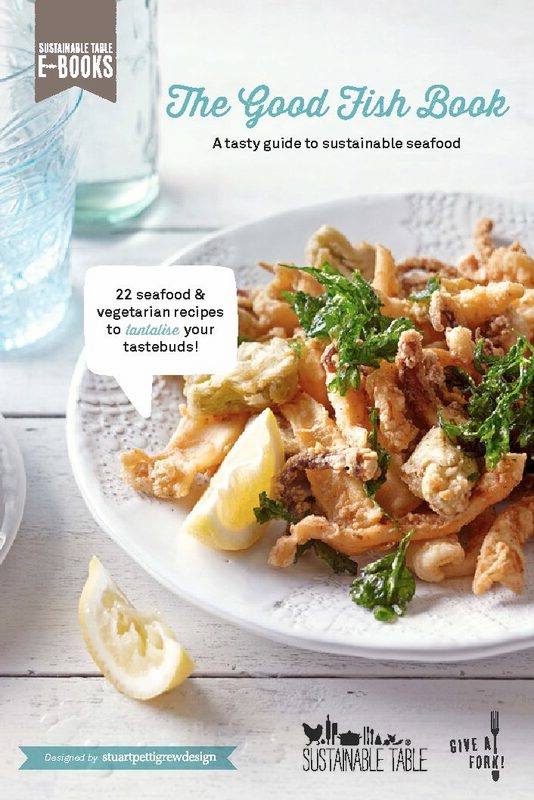 Buy our Good Fish eBook, with 22 delectable sustainable seafood and vegetarian recipes ($15). 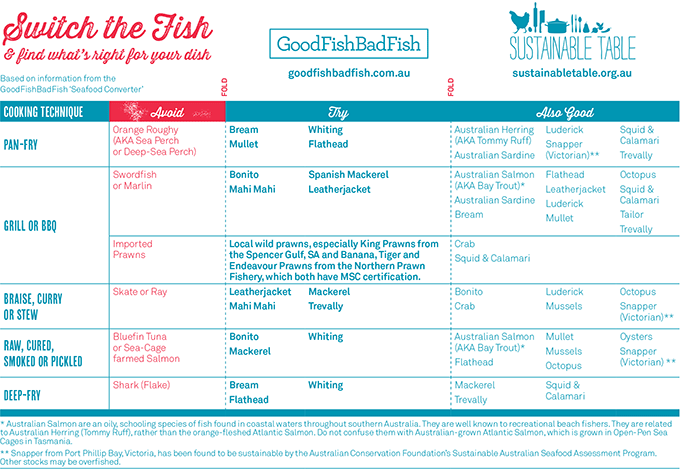 It’s Sustainable Seafood Day Australia!